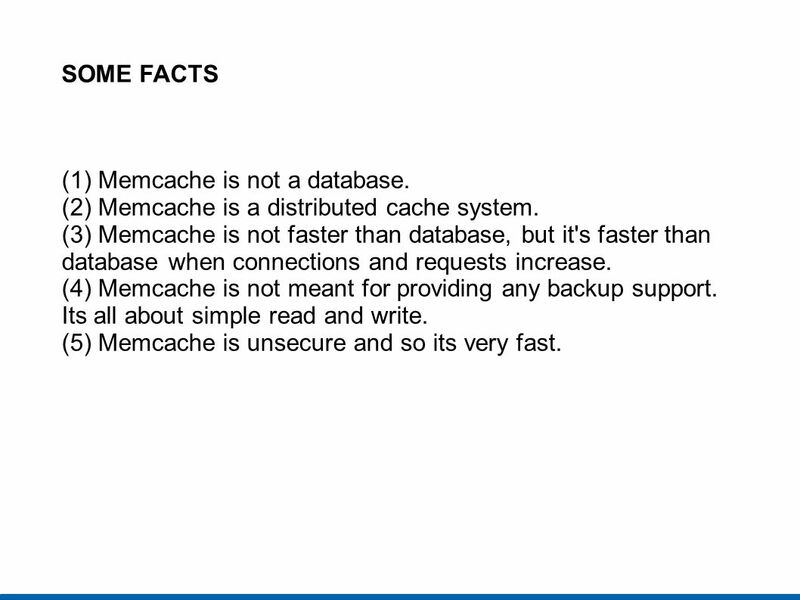 3 SOME FACTS (1) Memcache is not a database. 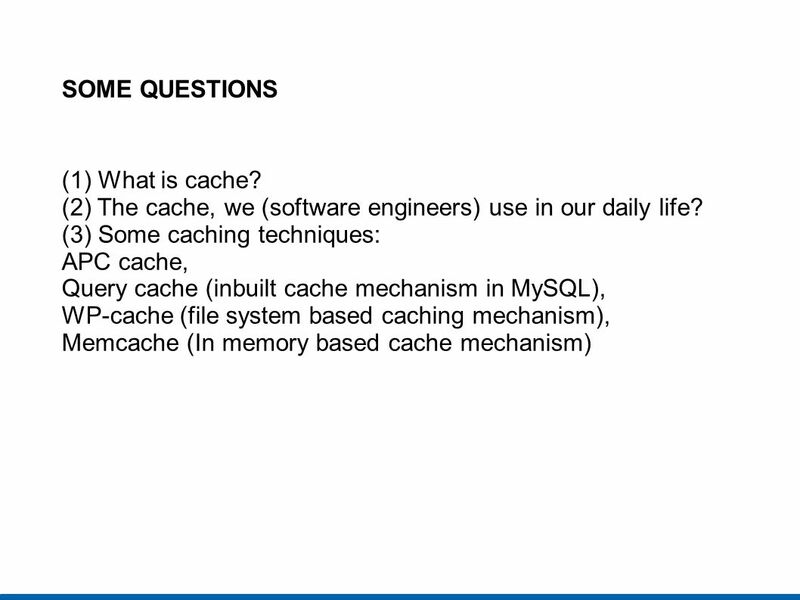 (2) Memcache is a distributed cache system. 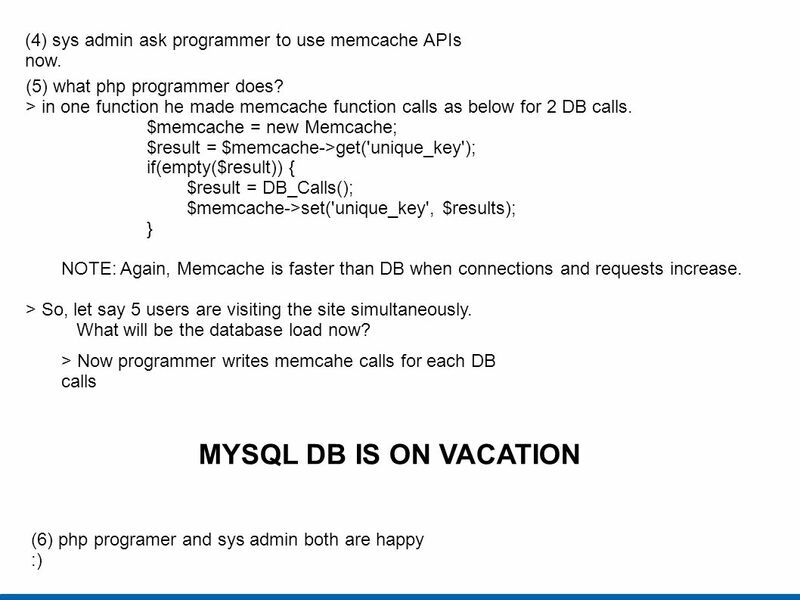 (3) Memcache is not faster than database, but it's faster than database when connections and requests increase. 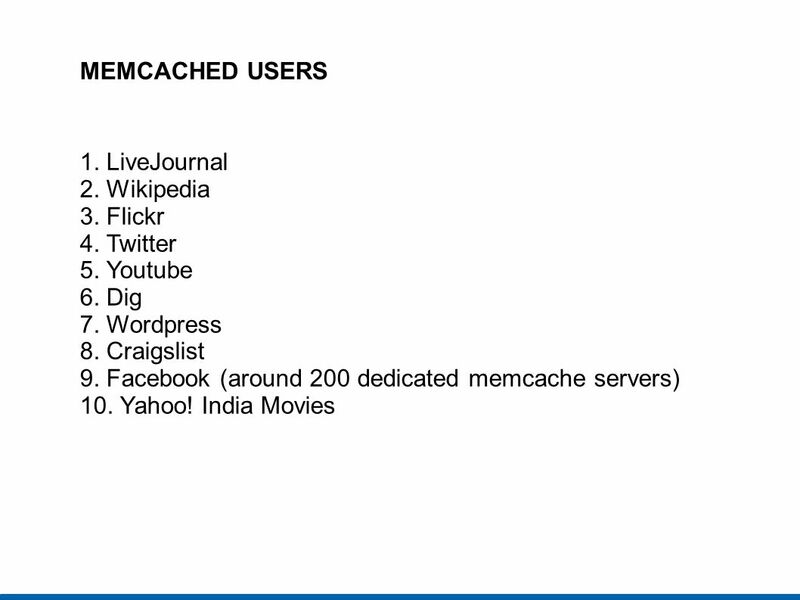 (4) Memcache is not meant for providing any backup support. Its all about simple read and write. (5) Memcache is unsecure and so its very fast. 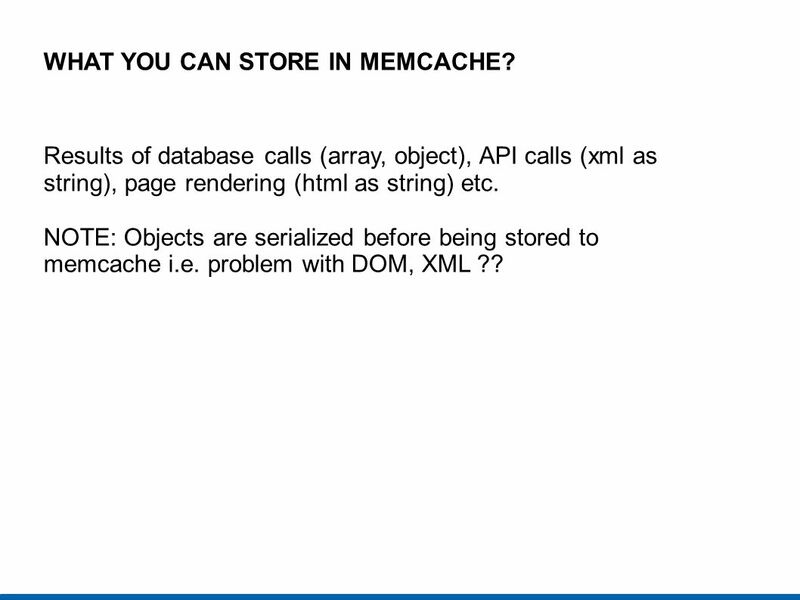 6 WHAT YOU CAN STORE IN MEMCACHE? Results of database calls (array, object), API calls (xml as string), page rendering (html as string) etc. NOTE: Objects are serialized before being stored to memcache i.e. problem with DOM, XML ?? 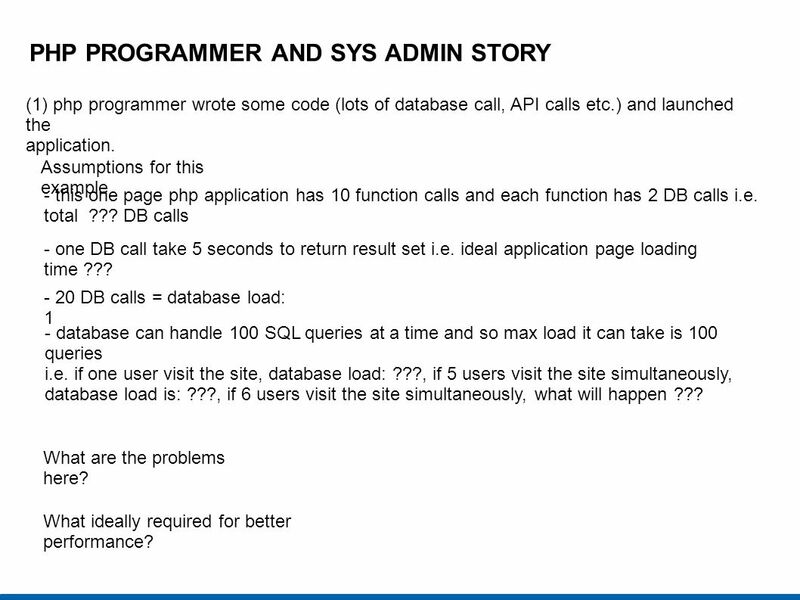 (1) php programmer wrote some code (lots of database call, API calls etc.) and launched the application. Assumptions for this example - this one page php application has 10 function calls and each function has 2 DB calls i.e. total ??? DB calls - one DB call take 5 seconds to return result set i.e. ideal application page loading time ??? - 20 DB calls = database load: 1 - database can handle 100 SQL queries at a time and so max load it can take is 100 queries i.e. if one user visit the site, database load: ?? ?, if 5 users visit the site simultaneously, database load is: ?? 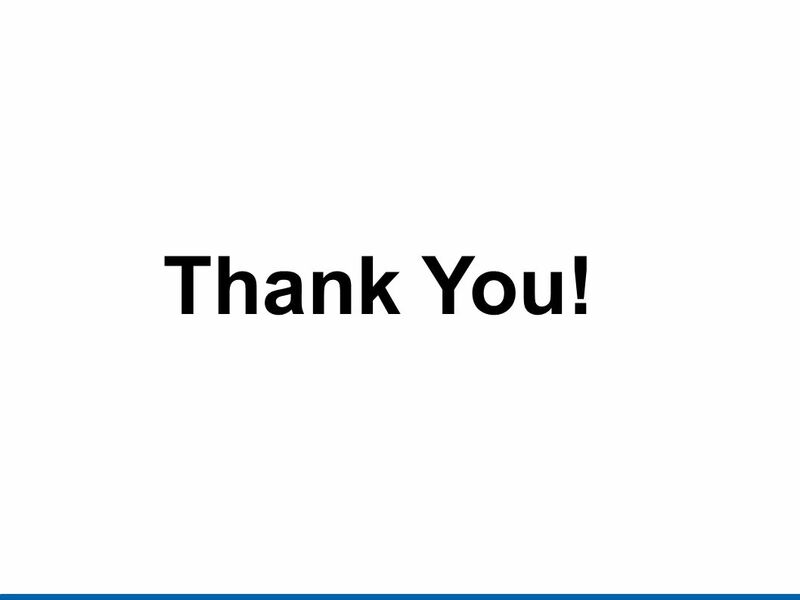 ?, if 6 users visit the site simultaneously, what will happen ??? What are the problems here? What ideally required for better performance? 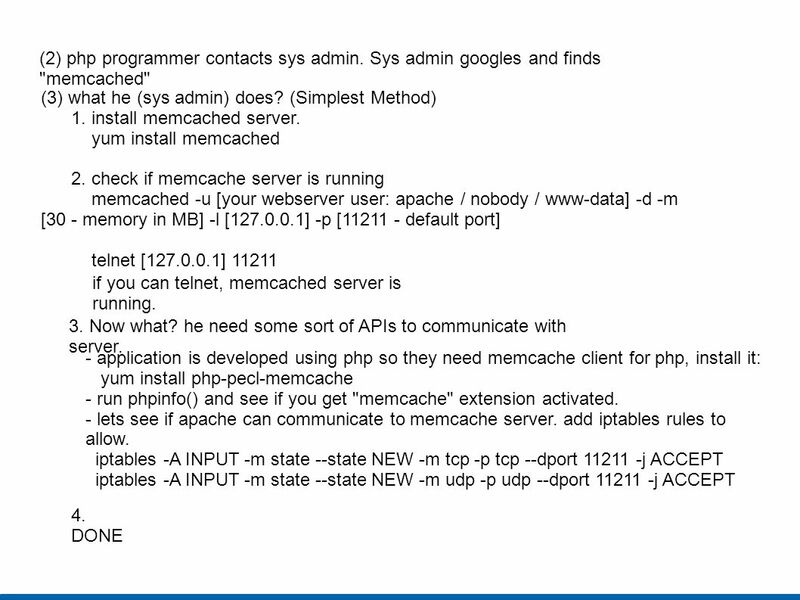 9 (4) sys admin ask programmer to use memcache APIs now. 10 (7) Now what? consider following condition. > let say application has lots of DB calls, lots of web pages, lots of API calls > all data written to DB and cache is using CRON jobs only. 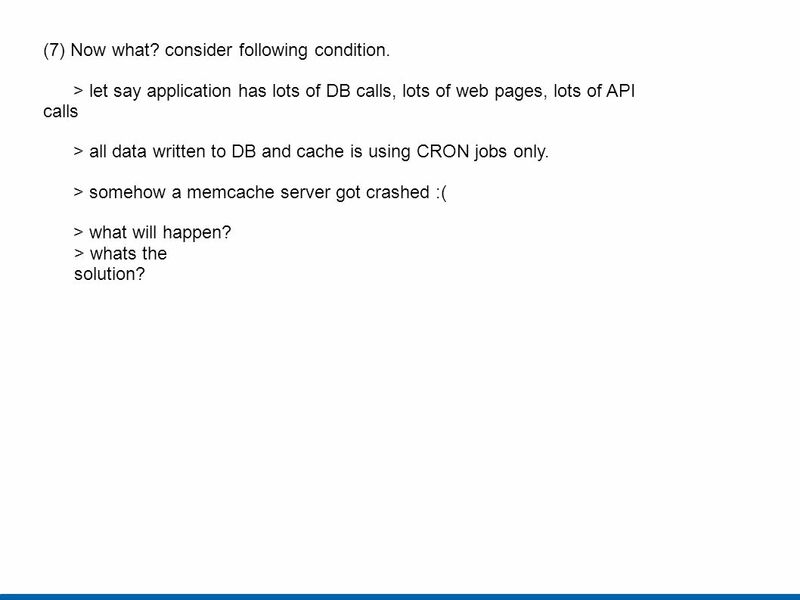 > somehow a memcache server got crashed :( > what will happen? > whats the solution? 11 > what will happen? memcache read will fail and it won't display anything on web page as we are reading from memcache only. > whats the solution? 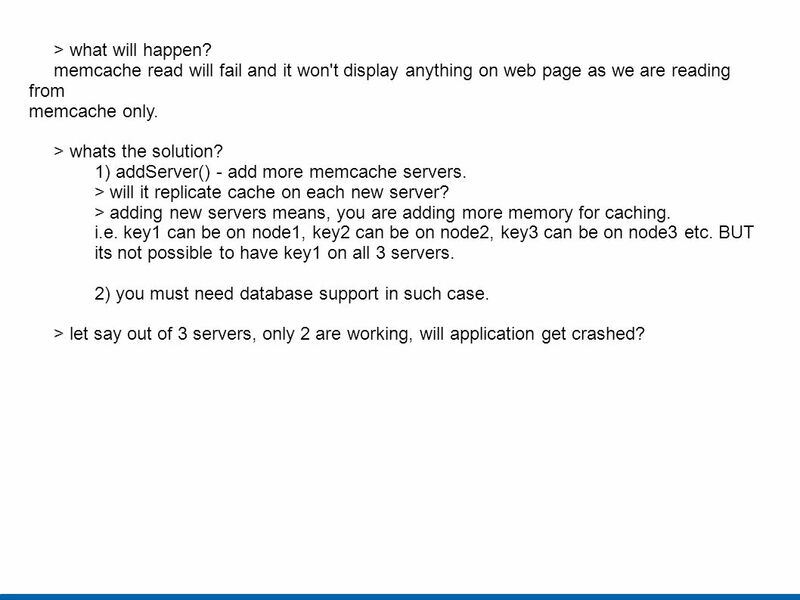 1) addServer() - add more memcache servers. > will it replicate cache on each new server? > adding new servers means, you are adding more memory for caching. i.e. key1 can be on node1, key2 can be on node2, key3 can be on node3 etc. BUT its not possible to have key1 on all 3 servers. 2) you must need database support in such case. > let say out of 3 servers, only 2 are working, will application get crashed? (2) What are the limits on setting expire time? (3) What is the maximum data size you can store? (4) Memcached is not faster than database. What's the goal? (5) What this code will do? 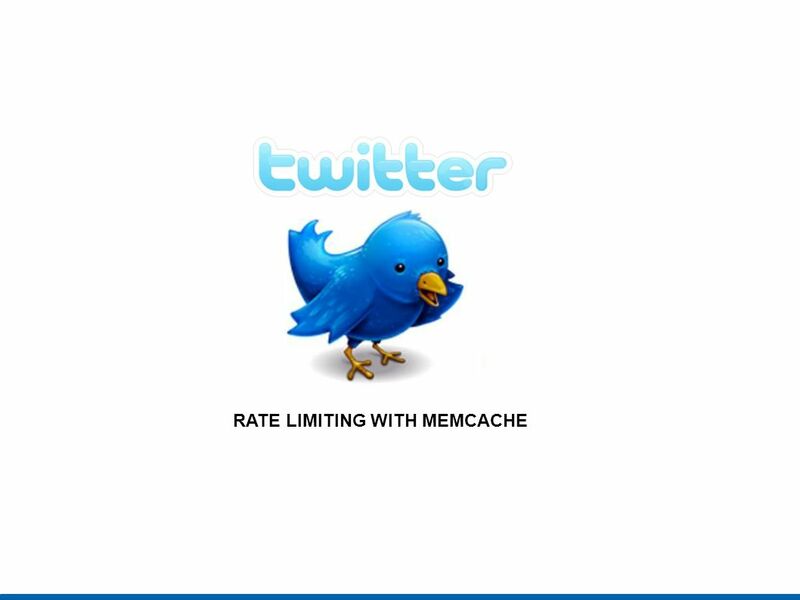 $memcache = new Memcache()‏ $memcache->addServer('node1', 11211); $memcache->addServer('node2', 11211); $memcache->addServer('node3', 11211); $memcache->connect('node1', 11211); (6) Other memcache functions? 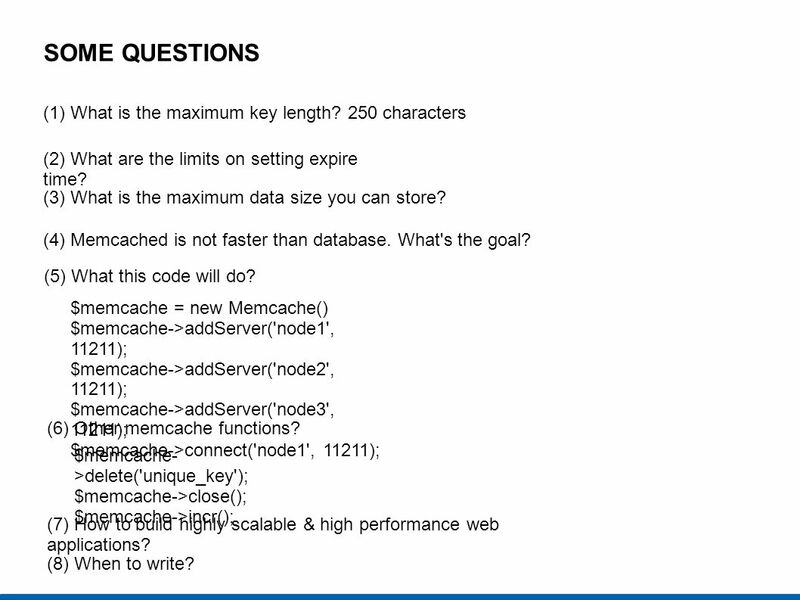 $memcache->delete('unique_key'); $memcache->close(); $memcache->incr(); (7) How to build highly scalable & high performance web applications? (8) When to write? session.save_handler = memcache session.save_path = "tcp:// :11211,tcp:// :11211,tcp:// :11211" - Its called session clustering (distributed sessions) using memcache pool. 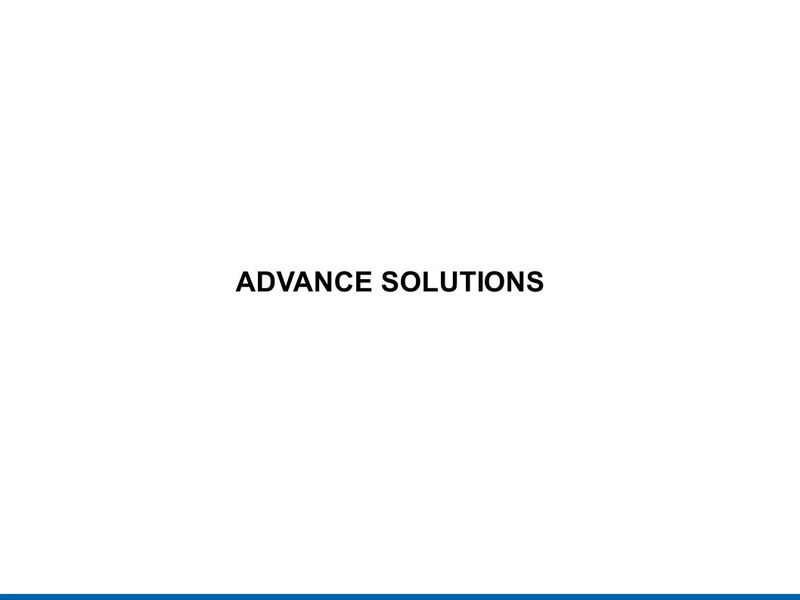 - Multiple application server instances shares a common pool of sessions. (Centralized Authentication System? )‏ - Store sessions to both DB and memcache. Why? - Write your own session handler that stores to the database and memcache. 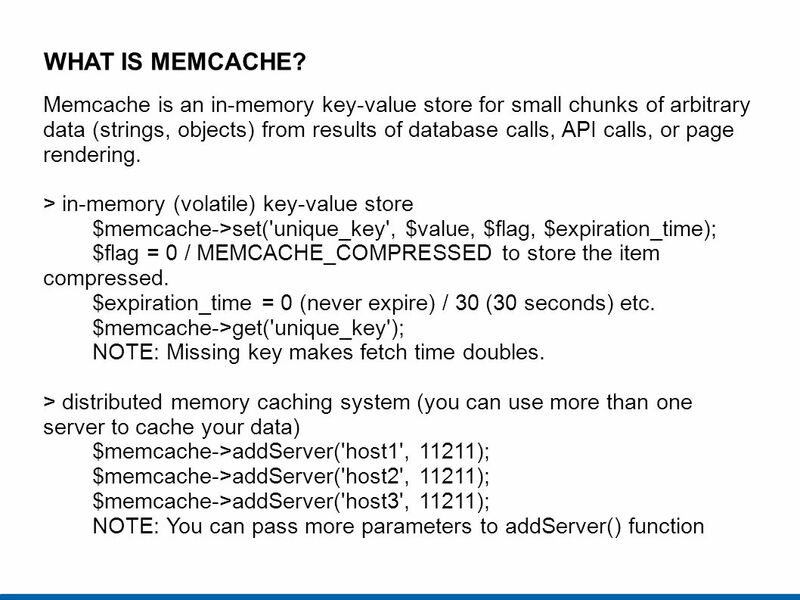 16 Query What is difference between memcache.redundancy and memcache.session_redundancy? 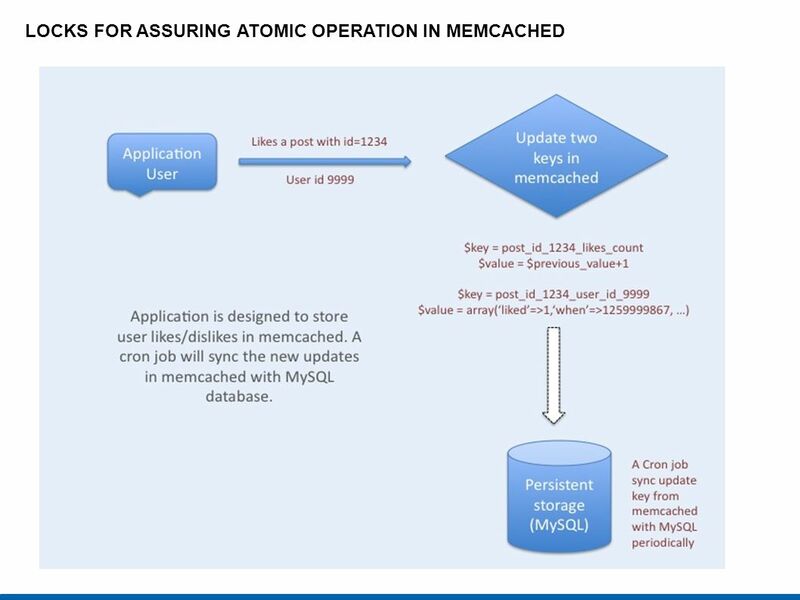 Let say I am setting memcache.session_redundancy = 2 i.e. session will be written to 2 servers. $memcache = new Memcache; $memcache->addServer(' ', 11211); $memcache->addServer(' ', 11211); $memcache->addServer(' ', 11211); $memcache->addServer(' ', 11211); So, how memcache will know which 2 server to choose? or it will consider following php directives and use and ? session.save_handler = memcache session.save_path = "tcp:// :11211,tcp:// :11211" what will happen if I set memcache.redundancy = 3 for above case with memcache.session_redundancy = 2? 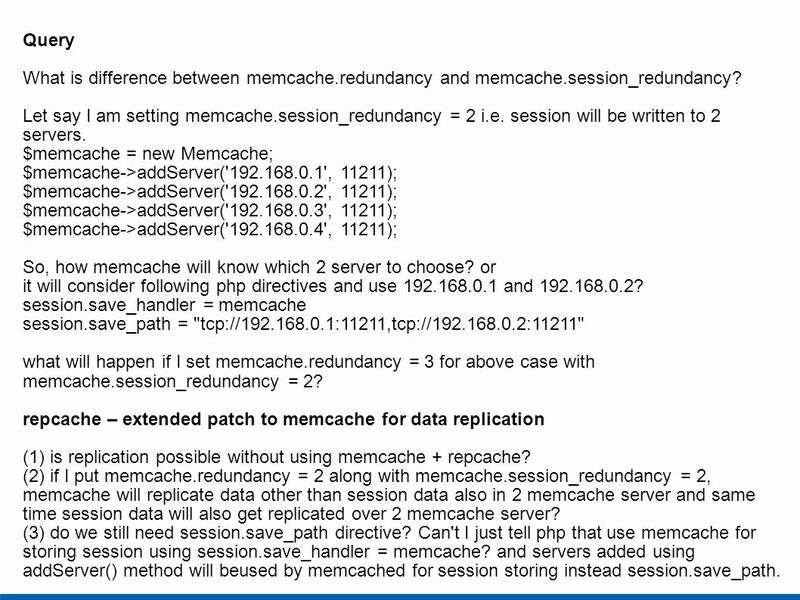 repcache – extended patch to memcache for data replication (1) is replication possible without using memcache + repcache? 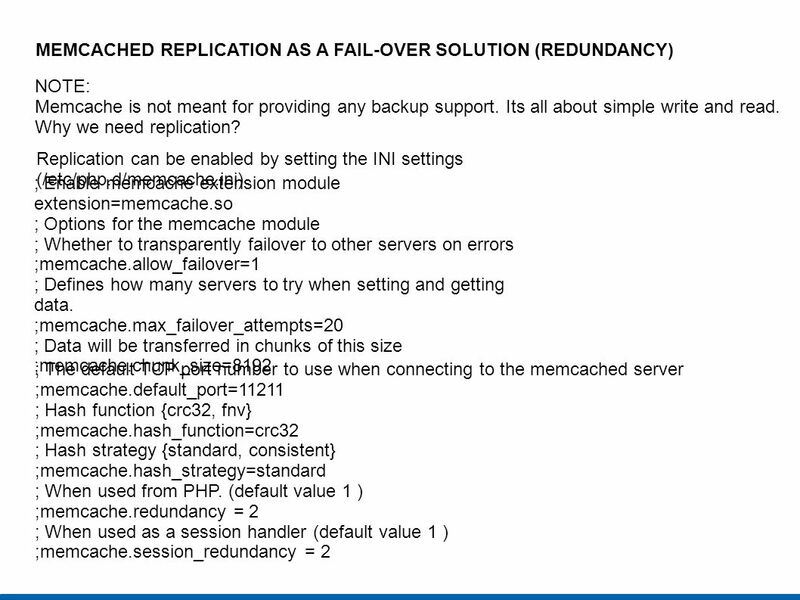 (2) if I put memcache.redundancy = 2 along with memcache.session_redundancy = 2, memcache will replicate data other than session data also in 2 memcache server and same time session data will also get replicated over 2 memcache server? (3) do we still need session.save_path directive? 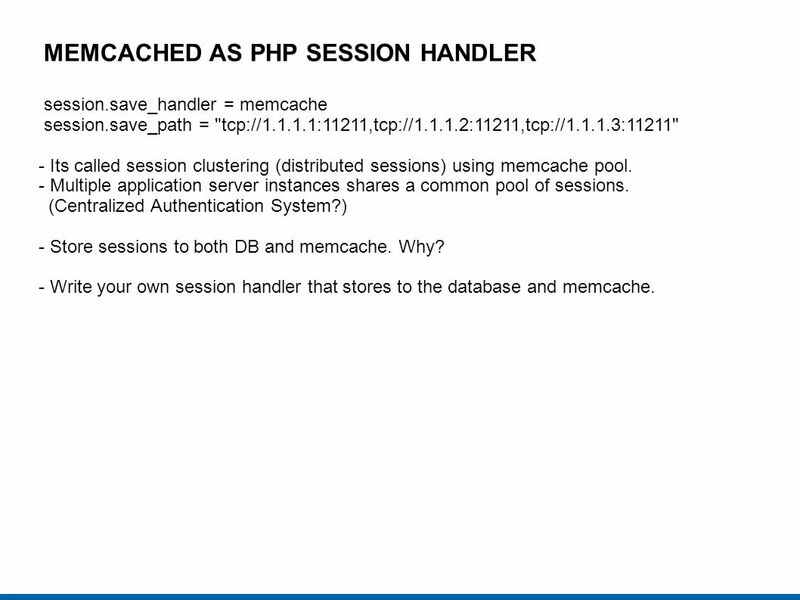 Can't I just tell php that use memcache for storing session using session.save_handler = memcache? and servers added using addServer() method will beused by memcached for session storing instead session.save_path. 17 CONSISTENT HASHING What is hashing? 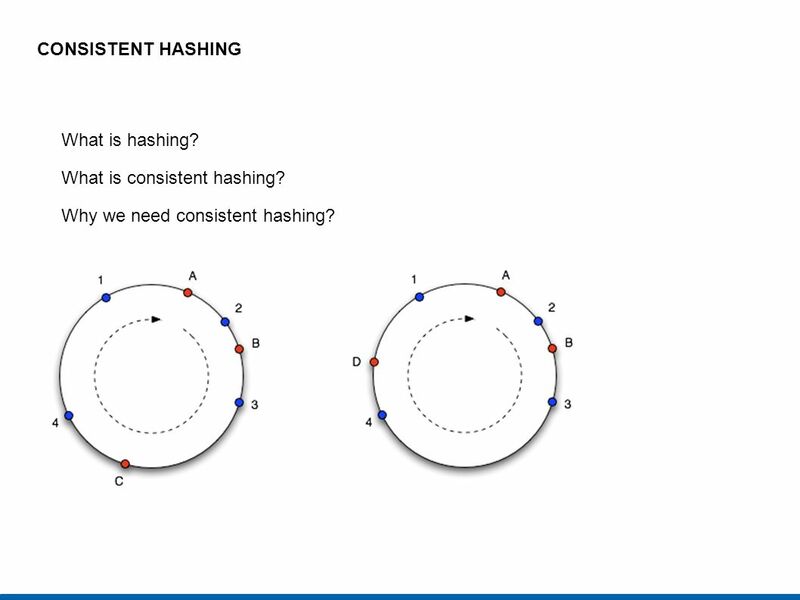 What is consistent hashing? Why we need consistent hashing? 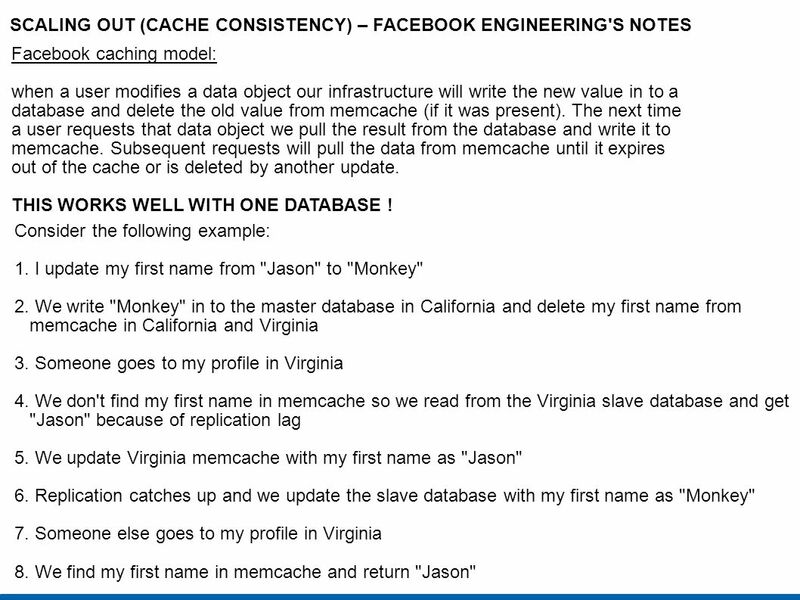 Facebook caching model: when a user modifies a data object our infrastructure will write the new value in to a database and delete the old value from memcache (if it was present). The next time a user requests that data object we pull the result from the database and write it to memcache. Subsequent requests will pull the data from memcache until it expires out of the cache or is deleted by another update. THIS WORKS WELL WITH ONE DATABASE ! Consider the following example: 1. I update my first name from "Jason" to "Monkey" 2. We write "Monkey" in to the master database in California and delete my first name from memcache in California and Virginia 3. Someone goes to my profile in Virginia 4. 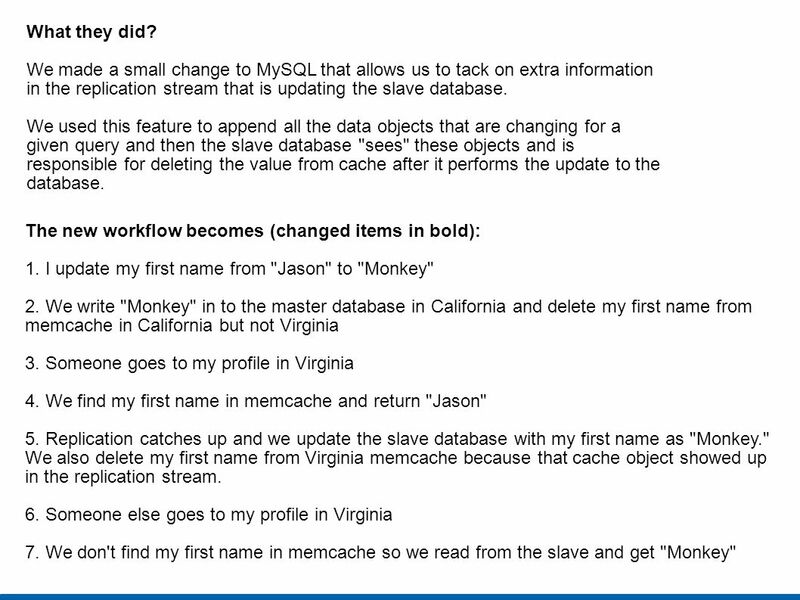 We don't find my first name in memcache so we read from the Virginia slave database and get "Jason" because of replication lag 5. We update Virginia memcache with my first name as "Jason" 6. Replication catches up and we update the slave database with my first name as "Monkey" 7. Someone else goes to my profile in Virginia 8. We find my first name in memcache and return "Jason"
19 What they did? We made a small change to MySQL that allows us to tack on extra information in the replication stream that is updating the slave database. We used this feature to append all the data objects that are changing for a given query and then the slave database "sees" these objects and is responsible for deleting the value from cache after it performs the update to the database. The new workflow becomes (changed items in bold): 1. I update my first name from "Jason" to "Monkey" 2. We write "Monkey" in to the master database in California and delete my first name from memcache in California but not Virginia 3. Someone goes to my profile in Virginia 4. We find my first name in memcache and return "Jason" 5. Replication catches up and we update the slave database with my first name as "Monkey." We also delete my first name from Virginia memcache because that cache object showed up in the replication stream. 6. Someone else goes to my profile in Virginia 7. 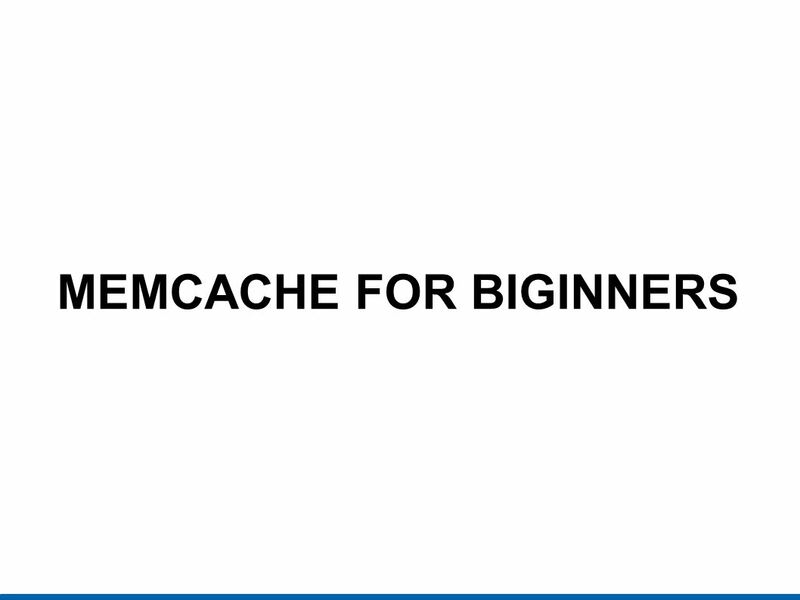 We don't find my first name in memcache so we read from the slave and get "Monkey"
Download ppt "MEMCACHE FOR BIGINNERS"
PHP II Interacting with Database Data. The whole idea of a database-driven website is to enable the content of the site to reside in a database, and to. XIr2 Recommended Performance Tuning Andy Erthal BI Practice Manager. Cookies, Sessions. Server Side Includes You can insert the content of one file into another file before the server executes it, with the require() function. Presenter: James Huang Date: Sept. 29,  HTTP and WWW  Bottle Web Framework  Request Routing  Sending Static Files  Handling HTML  HTTP Errors. Analysis and Performance Information Systems 337 Prof. Harry Plantinga. CMU SCS Carnegie Mellon Univ. Dept. of Computer Science /615 - DB Applications C. Faloutsos – A. Pavlo How to Scale a Database System. CLUSTER WEBLOGIC SERVER. 1.Creating clusters and understanding its concept GETTING STARTED. Google AppEngine. Google App Engine enables you to build and host web apps on the same systems that power Google applications. App Engine offers fast. An Introduction to ASP.NET Web Pages 2 Module 1: Webmatrix Installation and Your First Web Site Tom Perkins. How WebMD Maintains Operational Flexibility with NoSQL Rajeev Borborah, Sr. Director, Engineering Matt Wilson – Director, Production Engineering – Consumer. 22-Aug-15 | 1 |1 | Help! I need more servers! What do I do? Scaling a PHP application. 1 DIG 3134 – Lecture 3 Forms Michael Moshell University of Central Florida Media Software Design. Fundamentals of Web DevelopmentRandy Connolly and Ricardo HoarFundamentals of Web DevelopmentRandy Connolly and Ricardo Hoar Fundamentals of Web DevelopmentRandy.